As coordinator of the science department, we are planning to organize guest lectures for our high school students. We think this will help them understand a little more about what subject to opt for when they go in for higher studies. It will also give them an insight into something richer than the textbook world. What can we do as a school to make the experience enjoyable and rewarding for both the guest speaker and the students? I am delighted to receive this perceptive question because most educational institutions in India host a series of guest lectures when they find that they are ‘done’ with the syllabus and have some funding left at the end of the year to ‘invite’ a guest who is ‘available’ and will be willing to come for a small or no honorarium. The school/college often handles the lectures as chaotically as other things, showing scant respect not only for the speaker but also the subject! Remember, the speaker has to take away a positive image of your educational institution; your students too must remain driven enough to attend more such sessions and ask for more! So keep the following in mind. Invite a speaker whose subject is relevant to your students and who has the ability to come down to the level of your students. Your speaker has to be a person who will be able to unlock a new door of experience for your students and kindle more interest in the subject. Invite your speaker once the dates are firmed up. Do not keep sending messages or mails announcing a postponement or advancement of the date. Lack of planning is a serious reflection on the institution, and makes the speaker regret accepting the invitation. 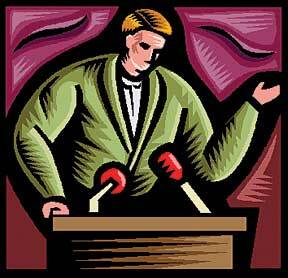 Decide firmly what you would like the speaker to share with the students. Do not keep changing the topic by offering lame excuses such as: The principal decided this would be a better topic or the head of the department felt this would be more relevant. Such messages either irritate or dishearten a professional speaker because she understands how ill-coordinated your institution is, and she wonders what kind of chaotic session will follow. Call the speaker over the phone and then reconfirm over mail. Do not keep disturbing the speaker with various kinds of requests or information. It can be most annoying to keep getting calls from the school with bits and pieces of information or requests. Extend the courtesy of picking up and dropping the speaker back. Do not cringe on the costs. This would be more appreciated than a bouquet or a token of appreciation. A day prior to the session, reconfirm the pick up details. Check to see that all the equipment is in place and is working. Have a technician at hand in case of a problem. Hold the session at a time when there is ‘normally’ no power cut. Ask one of your artistic students to make a poster giving details of the speaker’s name and the topic. Paste the poster on the door leading to the lecture hall. This is definitely a welcome sign to the speaker and also lends a personal touch. Prepare the students by having them read up on the topic. This will help them understand the subject and will keep their interest sustained through the lecture instead of showing signs of restlessness which will then tell on the speaker’s performance. Furnish the students a brief background about the speaker and impress upon them the fact that the speaker is coming to their institution for their benefit and therefore the least they can do is to listen in a focused manner. Tell the students that in order to show respect to the speaker and their institution, they must be on their best behaviour. Insist that they be seated before the speaker makes his entry. They rise when the speaker walks in, greet the speaker, write down points that are relevant, nod, maintain eye contact and continue looking interested. Tell the students to be prepared to ask questions. A speaker always leaves with a heavy heart when there have been no questions, because most of the time it implies that either no one was listening or no one was interested! As the staff of the institution, make the event a pleasant and well-organized one. You do want people to talk well of your institution and you do want to invite more people to share their knowledge with your students, don’t you?